Molecular oxygen does not hold well in water above baseline values. But with simple techniques, you can increase the amount of dissolved oxygen in your cannabis plant's water. The result is a much healthier and faster-growing crop. Dissolved oxygen (DO) is a term that defines the oxygen saturation level in the water. Point blank—the more oxygen in the water, the happier your plant's roots will be. The chemical formula for water is H₂O, meaning that for each oxygen atom, there are two hydrogen atoms attached. This bundle forms a water molecule. So then, you may wonder, how is it possible to have more molecules of oxygen in the water, if each water molecule can only have one oxygen atom? Without getting into too much science, think of it as chocolate milk. You mix chocolate into milk, shake, and voila—an instantaneous and delicious treat. Milk is still milk, chocolate still chocolate, but they blend nicely. The same principle happens with water and molecular oxygen—O₂. Moving water is healthy water; and as water flows and tumbles about in oceans, rivers, ponds, rain, and even municipal water systems, air gets shaken into the water, and molecular oxygen gets trapped inside—just like our chocolate powder in milk. On the contrary, stagnant water often turns “bad”. It is not the water that lost its shelf life, it’s that molecular oxygen gets depleted to a point where the perfect conditions for nefarious anaerobic bacteria happen. This is why you were told as a kid to never drink water from a pond. BUT WHY DO I NEED EXTRA OXYGEN IN WATER? You do not need extra oxygen in water to grow healthy cannabis plants. But if you want to grow healthier, bigger, and more productive plants, you should really consider it. Dissolved oxygen is the first line of defense against the dreaded anaerobic bacteria that cause root rot. It also promotes rapid root growth with a much higher density of fine root hairs, which are in fact the ones responsible for water intake. Water intake alone consumes a lot of plant energy in the form of oxygen. The increased availability of oxygen atoms also enhances the uptake of nutrients. Oxygen-deprived roots have no option but to substitute with other compounds and start producing ethylene, which causes cell damage and increases the chance of systemic disease. Even if such is not the case, oxygen-deprived roots will potentially cause a calcium deficiency. Some might become confused why adding cal-mag products does little to nothing. So the real question is, why wouldn’t you want to add extra oxygen? The best thing to do is to truly understand how dissolved oxygen works. If you have ever seen a hydroponic setup, you surely will have noticed air pumps and air stones. They are by no means the most efficient method, but merely one of the most convenient and cost/effective solutions developed decades ago. And virtually all ready-made kits have them included. But what if you are not doing hydroponics? Coco? Soil? Organic? It doesn’t matter, there is a solution for every situation. The truth is that air pumps do very little in terms of adding dissolved oxygen. At best, they are able to replenish consumed oxygen by plants, as they are 100% underwater at all times. This they do well because they not really replacing dissolved oxygen, but rather feeding more oxygen atoms to replace in water molecules, so fewer hydrogen atoms dissipate. The main variable that affects how much molecular oxygen water can hold is its temperature. The lower the water temperature, the higher the amount of dissolved oxygen water can hold, with far less effort than an air pump. Moreover, the upper limit for full molecular oxygen saturation in a real-life scenario (say, a grow room) ranges between 7–10ppm. In perfect lab conditions, this value may reach 50ppm. A typical dissolved oxygen meter can measure between 20–50ppm. These are very minute quantities, that if left unattended, will dissipate back into the atmosphere. But do not be fooled by these small numbers; the compound effect is quite big. This is why aeroponics are particularly effective for cloning, and roots have a virtually unlimited supply of both water and molecular oxygen. An excellent way of increasing dissolved oxygen is by getting a water chiller and recirculation pump to create some rippling or turbulence at the surface level. Not only is this method more effective than air pumps, but it is also much quieter too. This method is often referred to as “fluming”. Venturi systems work too, but unless you have a solid engineering background to perform some baseline calculations for optimal performance, all you will get are a few bubbles. You see, Venturi systems suffer from air column pressure. So the deeper you set your pumps, the less the Venturi effect will work. Even in a small living room aquarium, Venturis are quite ineffective, let alone in a 1m-high, 250l reservoir. The absolute best method is to create either a waterfall or a vortex. If you google “vortex brewer”, you will quickly find units to produce aerobic bacteria (the ones who love oxygen). In purely technical terms, nothing can match the efficiency of a vortex to increase DO levels in water. But, all of this is moot if you don’t consider water temperature. This is absolutely key. As mentioned before, the colder the water, the better—but roots will decrease metabolic activity below 16°C, so if you are running pure hydro, beware of that. Ideally, 18°C +/- 1°C is considered to be the sweet spot. Higher than 23°C, and you start entering root-rot danger-zone. On the other side of the spectrum, pure organic cannabis farming prohibits the use of a typical long-term automated reservoir, so what is the universal solution? Ideally, have a reservoir without any mixed nutrients and a chiller. Add a sturdy recirculation pump to create a fluming effect and increase dissolved oxygen. When you are ready to feed you plants, mix some fresh nutrients and shower your roots with this wonderful cocktail. They will feel refreshed and energised. As the grow room temperature eventually heats the water up and decreases molecular oxygen levels, the DO will have already done its job. 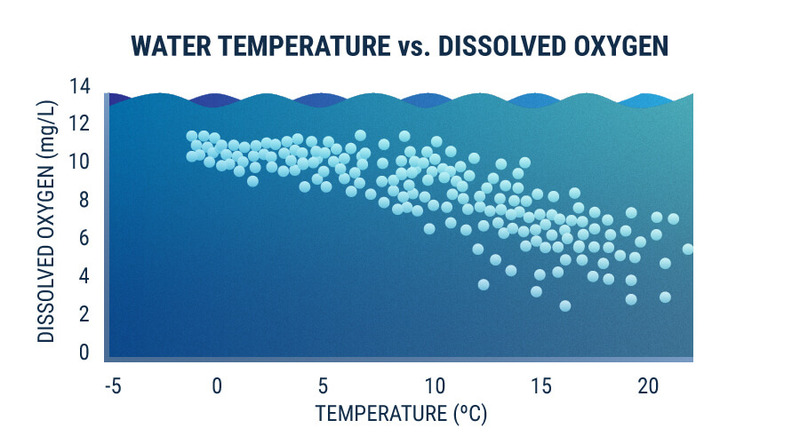 Dissolved oxygen is a little addition to your setup that can go a very long way. You fend off the bad guys, promote faster and more root hair growth, more aerobic bacteria, higher water and nutrient uptake, and an all-around happier plant.